Want to get admission into Craft Instructor Training courses under the aegis of National Council of Vocational Training (NCVT) will be made through All India Common Entrance Test 2017 Craft Instructor Training Course (AICET-2017) going to conduct on 12.08.2017 . Online Applications are invited only from the eligible candidates who wish to pursue the aspiring career as a ‘Vocational Instructor’ in Industrial Training Institute (ITI’s) across the country from 5 July to 26 July, 2017. Read on to know Read on to All India Common Entrance Test 2017 Craft Instructor Training Course application procedure, eligibility criteria, important dates and other important details on AICET-2017. 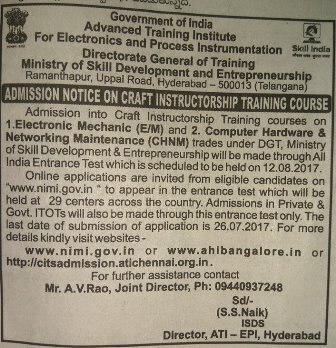 Ministry of Skill Development & Entrepreneurship (MSDE) is going to conduct All India Common Entrance Test 2017 Craft Instructor Training Course (AICET) on 12 August, 2017 at 30 centers across the country for Admission into Craft Instructor Training courses. Eligible candidates who wish to pursue the aspiring career as a ‘Vocational Instructor’ in ITI/ITC across the country can apply online on or before 26 JULY 2017. Age limit– No upper age limit is set to apply for AICET 2017 for admission to Craft Instructor Training Courses. Educational qualification– To apply for candidate must have NCVT certificate in relevant trade (NTC under Craftsmen Training Scheme / NAC under Apprentice Training Scheme ) or Diploma / Degree from recognized Board of Technical Education/University or equivalent. Eligible candidates can apply online at http://citsadmission.atichennai.org.in or http://www.nimionlineadmission.in on or before 26 July, 2017. All India Common Entrance Test 2017 entrance exam fee of Rs. 300/- for General Category & OBC and Rs. 100/- for SC / ST /PH/Women candidates can be paid online by using Net Banking/Credit Card/Debit Card. • 75% questions of objective type (MCQ) of ITI level related to the trade applied for admission. Eligible candidates can check their result by visiting AICET Result 2017 enter your application number, select the trade to check your result.